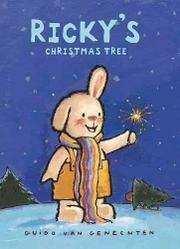 Ricky is a cheerful young rabbit preparing for the Christmas holiday celebration in this sixth entry in a series originating in Holland and Belgium. At first the bunny boy’s parents are too busy to get ready for Christmas, but Ricky convinces his father that they need to find a tree and prepare for the holiday. Charming illustrations on oversized pages show Ricky and his patient father working together to haul home their Christmas tree by sled, struggling through a snowstorm and tumbling together, head over heels, down a steep hill. Father and son recover to enjoy some time playing together in the snow, juggling snowballs and making rabbit-shaped snow angels together. A final spread illustrates Ricky and his parents relaxing together next to their tree decorated with real candles and a glowing star. Observant readers will notice the snow-white cat following Ricky throughout the day and peeking in the window in the final cozy Christmas Eve scene. Van Genechten’s paintings have a lovely, naïve quality, with bold shapes and thick, black outlines of the rabbits that make them stand out against the snow scenes. However, the plodding story and trite dialogue do not match the high quality of the illustrations.